"Being free, and being married - a contradiction." IFC Films has debuted a trailer for a British martial indie drama titled The Escape, from writer/director Dominic Savage (Love + Hate). This empowering indie first premiered at the Toronto Film Festival last year. Gemma Arterton stars as an "ordinary woman" who "makes an extraordinary decision which will change her life forever." She plays a married woman in the middle of a challenging marriage on the verge of ending, who decides to go her own way. Dominic Cooper co-stars, with a main cast including Frances Barber, Marthe Keller, Montserrat Lombard, and Jalil Lespert. This looks quite impressive, with what seems to be an exceptional lead performance by Arterton in a very complex and compelling turn as this unhappy woman, looking for an "escape". See the trailer below. A woman sets out to reclaim her life in this stirring, emotionally rich look at what it means to start over. Tara (Gemma Arterton), a housewife in suburban London, is living a life that is no longer hers: it belongs to her overworked, self-absorbed husband (Dominic Cooper); her young son and daughter; and the numbing routine of housework and childcare. In desperate need of a change, Tara one day makes a bold decision. Armed with a one-way ticket to Paris, she leaves everything behind to rediscover herself in a new city -- but walking out on your life isn't so simple… Built around a remarkable central performance from Gemma Arterton, the film is a perceptive, deeply compassionate portrait of a woman on the rocky road to becoming herself. 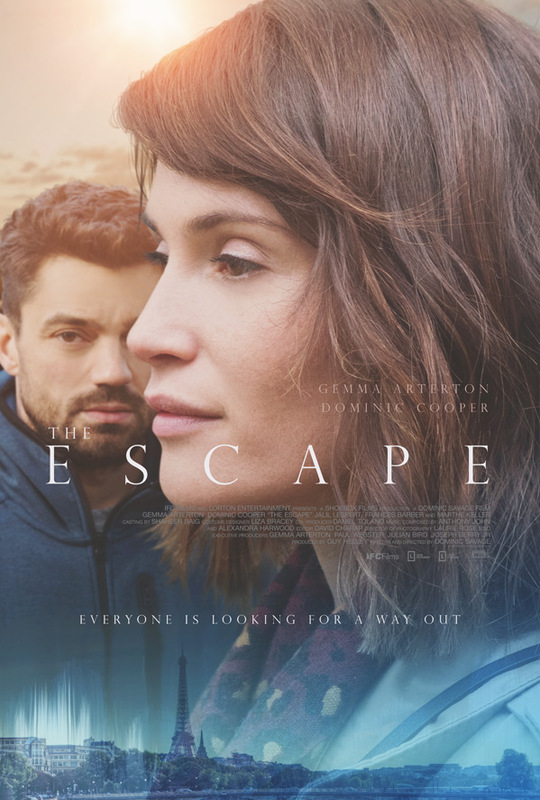 The Escape is both written and directed by English filmmaker Dominic Savage, of the film Love + Hate, plus TV work including "True Love" and "The Secrets". This premiered at the Toronto Film Festival last year. IFC will release The Escape in select theaters + on VOD starting May 11th this year.